In today’s article, we are going to see beautiful ways how to look sophisticated wearing pink this year. If someone asks me to name girlish color, the first hue that pops into my mind is pink. Indeed, pink is the color that most of us associate with femininity. That’s why pink is always a best-seller, no matter if you are selling clothes or beauty products. Some ladies avoid wearing pink when they reach an adult age. I know one thing, you are never too old for wearing pink. 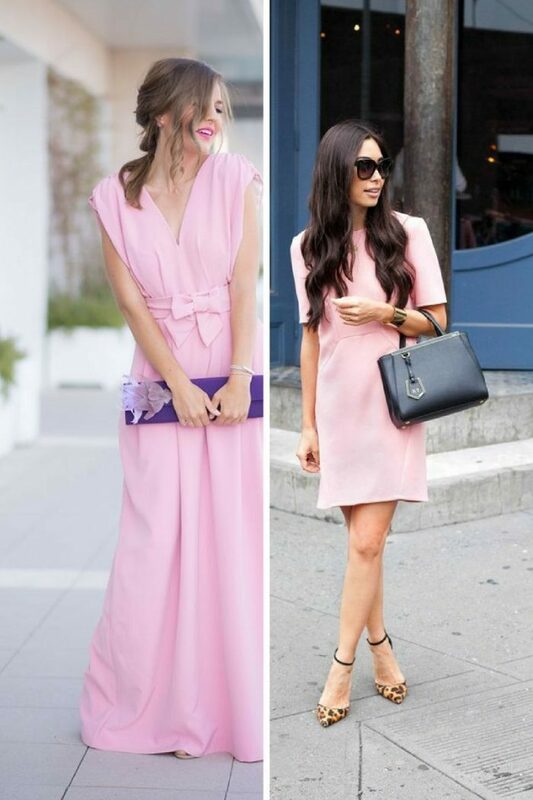 If you still find that pink is not your thing anymore, but you would love to wear it, then I recommend checking this beautiful compilation of fashionistas and stylists who appear on the streets wearing pink. If you afraid of wearing pink looks, then you should try pink on your lips. This is a great way to make you look sweeter. All you need is to add a splash of color on your lips by finding the appropriate shade lipstick. You can never go wrong with this beauty tip. If you are a bold woman and want to wear bright outfits, then the best way is to mix pink print with solid pink garments. Don’t be afraid looking like you are a little girl. This combo will create a much more mature and sophisticated outfit. Try on pink rose printed shirt tucked in a fuchsia high-waisted mini skirt, or keep it retro inspired by teaming floral print pink-red sweater with blush full mini skirt. Pink shades will for sure brighten up your neutral color outfit. Neutral looks can be boring sometimes, that’s why you can make them look exciting and sophisticated by adding pastel or bright pink garment or accessory. Those of you who love classy outfits can try on blush collarless jacket and style it with a white shirt tucked in cream-white relaxed trousers or there is a chance to make your look fresh, loud and modern by adding bright pink or fuchsia scarf. How about coloring your hair into a pink shade. Yes, you have to be brave and confident in wearing such shade in real life. Of course, if you work in the office, then you should avoid it, but you can try washable pink hair color to wear it on the streets creative social events. I recommend wearing pink shade hairstyle with an edgy black leather jacket and LBD. Yes, you can wear pink with dark colors. This is an ideal way to balance your everyday look. 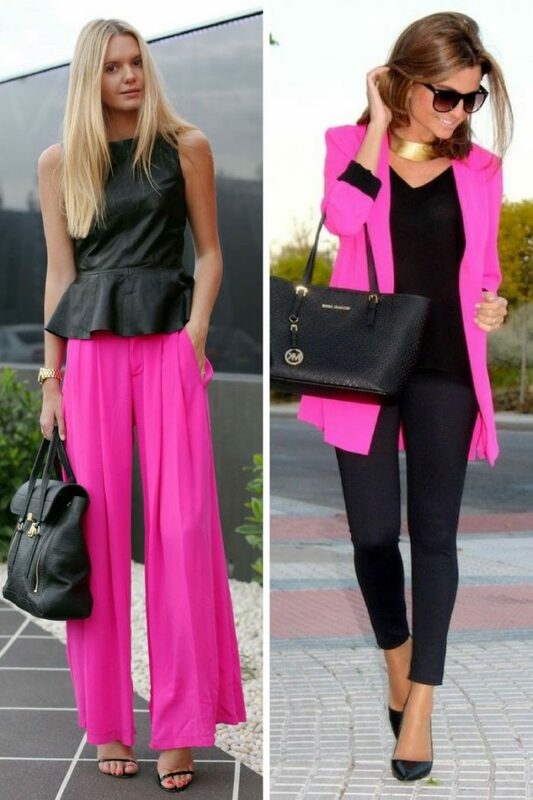 How about wearing black separates completed with fuchsia tailored suit jacket or make some fun with peplum black leather top teamed with fuchsia wide-leg trousers. The bright shade can be used as an accent to liven up your dark monochromatic outfit. Do You have any thoughts about Wearing Pink Can Look Sophisticated? Here are Fashion Tips pictures and trendy women’s outfits which are in style in 2019: Fashion Color Trends Report For Women, Must Have Fashion Trends For Women, Pink Accessories, Pink Clothes, Pink Fashion and tips on how to wear them on the streets.